When thinking about factors and things to consider when deciding on a school, there are obviously lots of criteria to weigh. The one thing that I believe is the biggest factor, is fit. Despite many people use this as a buzzword and downplaying the meaning of it, I believe it is a vital part. The fit of a school can come in many ways though. Whether that is just the feel you had when on campus, the joy it gave your parents, or one small aspect that you love, being in a place that is a good fit can make all of the difference. Fit can also take the role of your place in the college. For example, if a school isn’t the top overall school academically, but they specialize in your program, and rank towards the top of that, then it would be a great fit. For me, I am majoring in Sports Management and looked at some school with that majors, and others that didn’t have it. I came to the conclusion though, that it was the exact area in which I wanted to pursue, so Iowa was a tremendous fit for me in that way. A school that fits you well can also come in the form of a friendly campus visit. When I was visiting Iowa, I distinctly remember how happy and friendly everyone was. I would walk by them and they would say “hi” or just a simple, “Go Hawks!” This sense of community made me feel at home and was an aspect that was particularly unique to Iowa City. When I was on the campus of other schools, there were many people walking by with their headphones in and heads down. Immediately, I knew that I didn’t want to become like that, so therefore those weren’t a good community fit for me. Finally, when choosing a college one thing in particular to focus on is housing, dining, and recreational services. This may seem very basic, but it can play a huge role in your college experience, and especially your freshman year. Living in the dorms has been a fantastic opportunity for me due to the fact that I got to meet a great amount of caring people. To add, since you eat in the dining hall quite a bit, having an excellent dining facility and food (like Iowa does), has been a great attribute for me to have and enjoy. And lastly, with all of the time that classes demand, it is always nice to go to the Campus Recreation Center to blow off some steam and workout or play an intramural sport. So, having excellent facilities and opportunities in those is a nice perk for a school and a large thing to consider when picking a college. Good luck and Go Hawks! What made you decide to be a Hawkeye, and what do you love about it? After living in Iowa City for a couple weeks over the summer, I fell in love with the city, campus, and makeup of the university. My uncle and I would have so much fun going to different events downtown, hiking around the nearby lake, and going to some of the best restaurants in downtown. Going back to my home of Los Angeles for the rest of the summer, led to me long for the small-town charm that exists here in Iowa City. As soon as I missed being in Iowa City, I knew that this was my home. I immediately applied the first day that the application became available and was accepted a week or so after that. I was incredibly humbled by this opportunity and knew that this was my new home. I chose not to apply to any other schools due to the fact that I knew the University of Iowa was the place for me. Being from California led to lots of people asking me “why I chose Iowa” or even “where is Iowa on the map.” Despite this questions being very repetitive and nagging, I was more than happy to answer them. I loved talking about deep appreciation for Iowa and all of the great aspects that this university has to offer. From outstanding academics, to Big Ten sports, to an award winning college town, and everything in between, I was proud to talk about this university to others. After committing so early into my senior year, I got the unique chance to apply for many scholarships, get to know people, and even get acquainted with the university as a whole. To add, one of the best parts of being committed to the Hawkeyes, was being able to now wear all of my Iowa gear around Los Angeles. I was deeply impressed with how many people would stop me on the street to say, “Go Hawks” or ask me about Iowa. I loved being able to talk about the university and tell people why I love it so much. 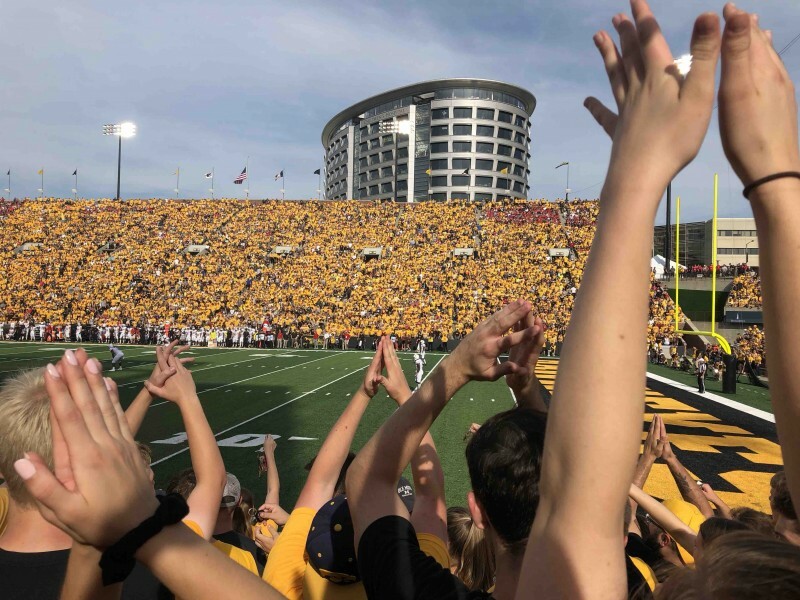 The amount of Hawkeyes in the world and the thriving alumni base is renown and allows people to have a connection, if they both share a love for the Hawkeyes. Overall, the kindness of all of the people and the vibrant life here in Iowa City has made it feel like home to me. I have met and became friends with so many people here and am blessed to have formed all of the relationships that I have so far. I have also been humbled by how nice so many people have been to me here and the general positivity that surrounds this whole campus. 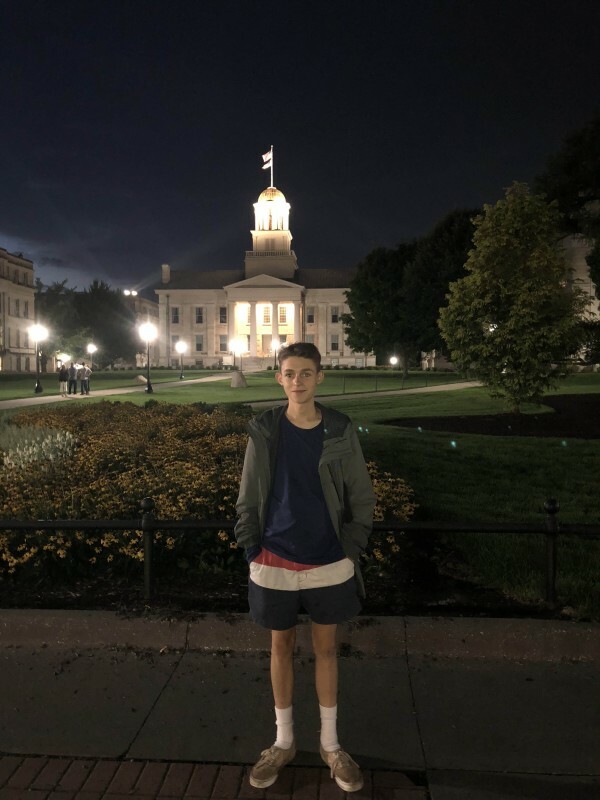 Posted on March 18, 2019 Leave a comment on What made you decide to be a Hawkeye, and what do you love about it? As students flood back to campus after a restful time at home, they return to what was an empty Iowa City. Without students, the city is completely different. No traffic, few pedestrians. Restaurants closing sooner, all are apart of winter break. Returning from winter break doesn’t only mean the start of classes, but also the start of the coldest times here on campus. Below I have some of my best tips on how to beat the “Winter Blues”. While it may be easy to just merely complain and vent to your friends about the weather, it is best not to. Everyone is dealing with the same conditions, so embracing it is the best piece of advice. The more you talk about the weather and how cold and wet it is, think and realize that you are only making it worse by exacerbating the problem. The best way to combat the cold weather is to drink warm drinks. 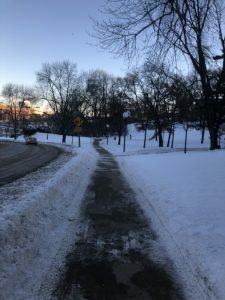 Whether that is coffee, tea, or hot chocolate, having a warm beverage in your hand on the walk to class or just after a meal in the dining hall, it can help tremendously in warming you and it is also tasty. 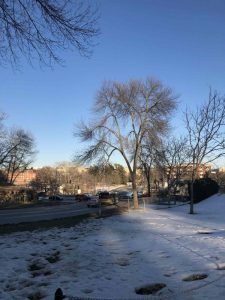 Most buildings on campus are fairly close to one another and are within reasonable walking distance, so the bus isn’t a necessity for most everyday use. However, in the midst of the cold weather, the bus can be very clutch. The BONGO App provides live updates on the various routes that go around campus and when they are predicted to arrive at the stop you are at. Stops are located all throughout campus and the routes touch everywhere around the city as well. Riding the bus is very convenient and can save you from a long walk in the cold. The winter season also means that various viruses are going around campus and in the dorms. Getting your studying done earlier in the night ensures a long and restful night of sleep, which can do wonders in healing and getting better from a sickness. Also, getting studying done earlier leads to better comprehension and less stress. Overall, the winter is a great time in Iowa City. Classes are starting up, basketball season is in full swing, and the campus is bustling with students. However, following these tips can hopefully help in ensuring a safe, warm, and ideal start to the semester! I know you are enjoying the sunny and 75 degree weather back in Los Angeles. Here in Iowa City, winter has come a bit early. We had our first snowfall this last weekend and the colder temperatures have come as well. As I am living away from home for the first time, I am starting to realize all of the aspects that come with being an adult and living on my own. I am realizing the ins and outs of life that I always took for granted while I lived at home. I must say however, that I love the freedom that comes with living on my own. I have the ability to go and hang with friends whenever I want and I feel I am not restricted by any specific schedule (other than my classes). Planning my own schedule for the day has been a blast and I truly enjoy the chance to make my own plans. Iowa City has been a fantastic place to live and I feel so welcomed by everyone here. I know the whole “Midwestern Hospitality” may be a cliche, but it is real! Everyone is so friendly and caring here as opposed to the big city of Los Angeles. I have also found some terrific communities to make lasting friendships in. Through the campus ministry of Salt, basketball managing, and my overall classes, I have created some great bonds with people who share the same interests as me. Finding my communities here at Iowa have been seamless and you encouraging me to go out and meet people was some great advice. I can’t wait until you can come out here and freeze to death with me while I show you around Iowa City and all of the exciting things that I am involved in. I miss you, but am more excited for you to come and see what I am up to. My friends and mentors have truly made this place feel like home (sorry). I have had a fantastic first semester here so far and can’t wait for the second to begin after winter break! It has gone by too far and I love that you keep reminding me to make the most of it. I love you and will see you soon! Coming from Los Angeles, CA to Iowa City is definitely a stark contrast. Going from 16 million people to 75,00 people is an adjustment. Going from sitting in two hours of traffic to being able to walk from one end of the city to the other is a change. Going from knowing no one while walking around to seeing five of your friends walking from class to class is different. Now these are just a few of the many ways that Iowa City is different than Los Angeles or any big city of that matter. Going from 80 degrees everyday and sunny to 15 degrees is quite different. 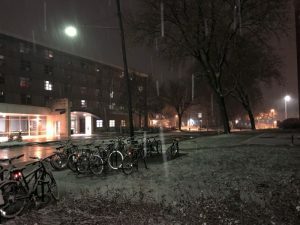 Not only have the leaves changed drastically, but Iowa City finally got its first snowfall of the year, and it could not be nicer. Since this is one of the first times I have ever seen snow, I appreciate it so much more than students from the Midwest area. I’ll be honest though, for one night and brief day, the snow was beautiful and bearable, but I am not too sure how I will do bearing through this weather on an everyday basis. While obviously Iowa City isn’t for everyone, I have found a love for this fall season here so far. The changing of leaves and colder weather hasn’t affected me too greatly (yet) and I have loved to small sense of a quaint college town. Seeing friendly faces all around and knowing people within your city has been a perk that I love of this great city. Here in Iowa City, people genuinely want to know you as more than just a student or whatever role you are in. Residents of Iowa City are actively engaged within the community and the college town environment. Also, all of the students are incredibly respectful to the community that surrounds the college. I have met amazing people and have engaged in community events which helps to bridge the gap between students and residents. I truly feel as though I am not merely a student here, but a resident in Iowa City. This distinction is crucial due to the fact that I have no longing to go home, because I have found a home here. I feel welcomed wherever I go and have cultivated a community with many people here with whom I could talk with for hours. The differences from a big city to a smaller town as noticeable and should be a factor weighed within a college decision. I truly believe that going to a quaint small college town is a terrific opportunity that encourages community engagement, school spirit, and a sense of belonging that is unmatched by any big city. This city has all of the fantastic resources of a large scale city with sports, art, and culture, but has the small, cozy, college town feel that one can only get while living in a city like this one. After a quick first two months here at Iowa, there has been a variety of amazing moments and fun experiences. But none of those experiences could have happened if it wasn’t for the community that has surrounded me. Coming into Iowa and knowing nobody, I was scared about whether I would fit in and if I could find a community of people for me. That worry has been definitely resolved! Quickly I have found many great friends whom I know I can call in any situation and they will be there for me. Also, I have a diversity of community groups that I have become a part of which each represent a different area of my life and passions that I have. What I love about each of these communities is that they each play a vital role in my Iowa experience and all touch on my interests. For starters, since I am a basketball manager, the basketball team and community has been a great home for me. I have met and become friends with many of the guys and feel a sense of community in that position. I truly love my job and that is in large part due to the fantastic people that I interact with everyday. Also, as a Christian, the community that I have cultivated through the Salt Company has also been one I can lean on. Salt Company is a college ministry that meets every Thursday Night. They are a part of Veritas Church as well, so there is a community for me on Sunday mornings too. To add even more to that, I am apart of a connection group with some senior mentors who help guide me along the way through my faith and overall experience at Iowa. No matter what community group you choose to be apart of, there will be a multitude of people who look out for you and care for you through everything. Finally, I have felt an incredible sense of community in all of my classes. In my smaller classes like Rhetoric and some of the discussion sections, I have built strong relationships with many fellow classmates and have been able to collaborate with them outside of the classroom. Even in my larger lecture hall classes, I have met many great people of whom I sit next to and learn from as well. This social interaction and community within the classroom helps not only with my learning of the materials, but also with the feeling of a sense of belonging within the large lecture hall settings. Overall, through all three of these areas, I have found tremendous individuals for me to bond with, learn with, share life with, and have great time with. These three areas represent a large area of my interests and life and to find people within each of these settings, has allowed me to enjoy my college experience exponentially more. I know there are people I can call on in any circumstance and I know they will be there for me! Many high school students have a misconception about large school college classes. While some of my classes are large lecture hall settings, there are also weekly discussion sections of them with a TA where we can engage in discussions with our peers to advance our knowledge even more. These sections allow us to connect more personably with a credible teaching assistant to further our learning. Also, it gives us a better chance to connect with fellow students for group projects and to engage more with the content. Throughout my first month here at Iowa, the adjustment to classes has been incredibly smooth. The professors each make themselves greatly accessible to every student. If you (as the student), take time to go and seek our your professor’s help then they will guide you through whatever you problem is. This access to professors can help students develop a personal relationship with them. After now having taken my first college exams, finding your teachers for office hours has greatly assisted me in my learning and ability to comprehend the information. Whether it is just reviewing your notes with a professor, it can lead to an advancement in your education and knowledge. I love how the professors are willing to engage in vivid conversations with students on their subject matter. Also, a great aspect of Iowa is the ability to to take even general education classes that you are genuinely interested. I am currently taking Media Uses and Effects as a general education, but I also have a distinct passion for this course material. I am specifically fascinated with how the media affects sports business and marketing. It is interesting to see the link between the course material we are learning and my personal passion of sports. In this course, I also have the freedom to partake in an extended project where I am looking into research in the field of how the media plays a role in sports. This wouldn’t be possible without the professor being available to talk personally with me and them taking a genuine interest in my education. I am extremely humbled by the magnitude of personal interest that the professors put into student’s lives. While everything thinks they can come to a large university and be essentially anonymous, this is not the case at Iowa. Sure, you could just fade into the back of the class and not make yourself available, but if you put the time and effort into connecting with your professors, they will be more than happy to get to you you and help you with anything you would need! Gameday Experience and Hawkeye Family! As I entered Kinnick for my first time as a student, I immediately felt the energy radiating from the student section. The volume and electricity that resided in the stadium was unprecedented. 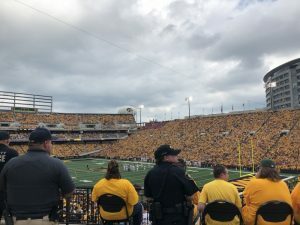 Fans had all been waiting for a long eight months for Hawkeye Football to return and so the excitement was more than justified. Me, being one of those fans who were eagerly waiting for this game, loved the atmosphere in Kinnick. The entire gameday experience made the game even better. My dorm mates and I walked over from Daum Hall, across the river, to Kinnick to arrive two hours before kickoff. We were all so excited for our first game as students at Iowa. We were lucky enough to get great seats and to have a great view of the game! When AC/DC’s “Back in Black” began to play, the excitement continued to grow rapidly. As the Hawkeyes swarmed out onto the field for the first time in 2018, I began to take in the greatness of this moment. It made me realize that this sort of atmosphere in Kinnick Stadium was the true reason I came to a quintessential college town like Iowa City. 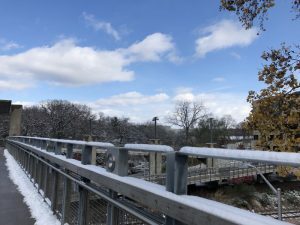 That morning when my roommate and I walked over to the Campus Recreation Center at 8 am, we saw people already walking and driving over the Iowa River to begin their tailgates. The large tailgating display and dedicated Hawkeye fans showcases the vast Alumni network of proud people who call themselves “Hawks.” I first realized this family of Hawks when I was living in Los Angeles. As soon as I got the acceptance letter to Iowa and committed (on September 1st of 2017), I began to wear around Hawkeye gear non-stop around Los Angeles. 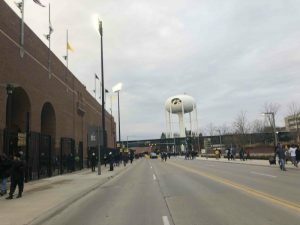 Whether I was walking on the beach, into a coffee shop, or even at a Clippers game, I would hear random people strolling by who would yell “Go Hawks.” Being over 1,750 miles from Iowa City and hearing the phrase, “Go Hawks,” immediately diminished any fear I had in my mind about going to a school far away from home. Hawkeyes support each other through everything in life and never try to be manipulative to beat them. Many of my friends at their colleges feel a sense of competition among their peers to be the best in their class or advance the farthest in their department, but at Iowa the sense of community and virtue of “loving your neighbor” reigns as the main priority. The entire gameday experience from when we entered Kinnick to when we all left, was one of the many reasons that I chose Iowa over many other universities. To add to this, the Hawkeye fan base was passionate about their team and cheering them on to a great victory. Despite all of this cheering for the team, the true heart-warming spirit for the afternoon occurred at the end of the first quarter when all 70,000 Hawkeye faithful in Kinnick Stadium waved to the brave children up in the hospital for the first time of 2018. 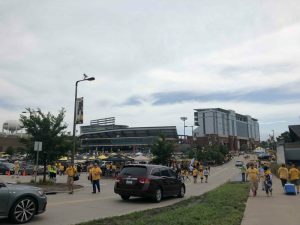 Posted on September 4, 2018 Leave a comment on Gameday Experience and Hawkeye Family! First Week living in Iowa City! As soon as I arrived on campus for the early move in on Sunday August 12th, my mom and I immediately felt at home. The warm welcome from all of the Iowa Student volunteers as well as from the other people already moved in on my floor, made me realize that this place was truly home for me now. Coming from Southern California, the classic “Midwestern Hospitality”, is something that may sound cliche, but it truly is something that exists. As Monday started and Honors Primetime classes began, the hospitality continued. We went to our respective classes and begun with our projects for the class. The task for my class entitled, “Iowa City Guide,” was to explore and wander around Iowa City and find an interesting spot near campus. This spot could either be a store, restaurant, park, etc. Our group walked around Downtown for at least two hours and got to see many diverse parts of this great city which helped me become comfortable living here. Once my group discovered the place we were going to report on (a Coffee Shop called “Cortado”) , we wrote many drafts, in which we discussed the Cafe in detail and interviews with a barista working there and a customer. We also collected some photos to include in our post. The three of us also was able to bond through this project and critique our own writing along the way. The beautiful part of this project was getting the opportunity to bond with some people who I just met and get the chance to wander around this exciting city more. Once you actually visit and live in Iowa City, you truly come to realize how much the city and The University co-exist. Classes will be located next door to some fantastic restaurants or even your dorm (like mine) will be a block away from the buzzing downtown area. In the middle of the primetime classes, there has been many great events I have attended to get to know and bond with my fellow freshman and upperclassmen as well. Members of “The Salt Company”, a Christian ministry on campus, invited some of us Daum Hall residents out to the recreation fields to play some beach volleyball, ultimate frisbee, and soccer. They provided transportation to the fields and talked to all of us from an upperclassmen’s perspective. They shared with us their own On Iowa stories and memories. It was a great opportunity to talk to them about their adventures at Iowa and hear their experiences on campus so far. In addition, they explained to us the premise of the Salt Co. and the Christian community that they have built through it. With over 500 members, the Salt Co. is one of the biggest groups on campus and it was nice to find a Christian community like that within my first two days on campus. Once my classes ended for the week, then all of the On Iowa! festivities began! Friday began with a Coffee Crawl. The “Crawl” involved fifty of my fellow freshman and I walking around Iowa City scouting out different coffee houses to try and see which one was our favorite. Friday, however, got even better as the night came. Friday night was the famous “Kickoff at Kinnick” event. 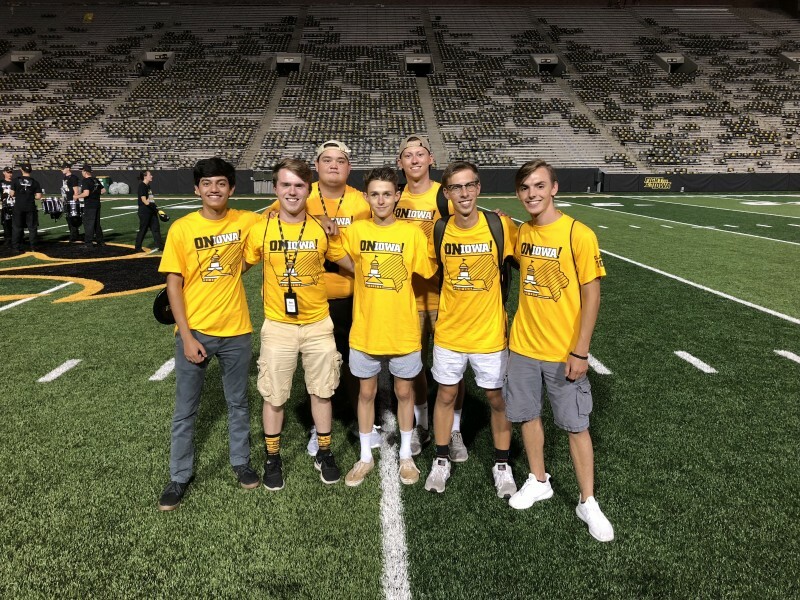 Going onto the field at Kinnick Stadium was a sight and dream in itself, but even more so than that, the bonding experience between my friends and I was incredible. 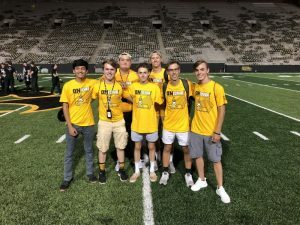 Within less than a week of being on campus, my fellow dorm-mates and I in Daum Hall were running 40-yard dashes and kicking field goals at Kinnick Stadium. Coming from Southern California, and not knowing many people at Iowa was a scary thought to begin with. Homesickness was also a significant worry of mine coming from over 1,750 miles away to Iowa. 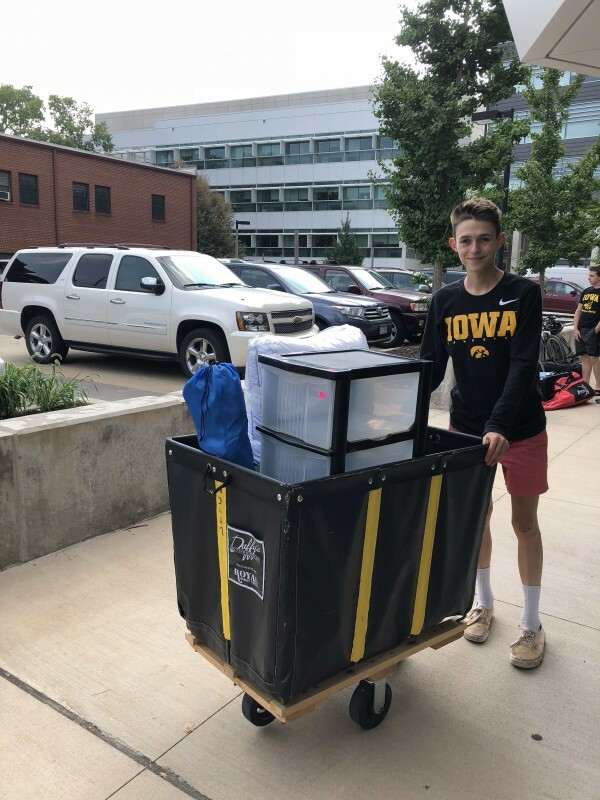 But I must say, the community I have already formed here at Iowa which includes my roommate, dorm-mates, upperclassmen, and other freshman, has helped me through this transition to living in Iowa. 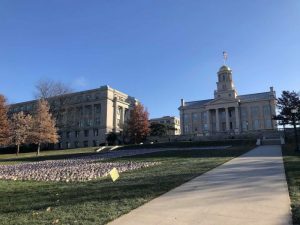 As cliche as it may sound, even within my first week, I feel as much a citizen of the Iowa City Community, as I do a student at The University of Iowa. The On Iowa festivities culminated with Convocation and the Block Party at the house of President, Bruce Herald. Over the course of this week, I have made potential friends for life, had phenomenal experiences, immersed myself within the community, discovered many student organizations, all while just enjoying life on a college campus for the first time, before the rush of classes begin next week. 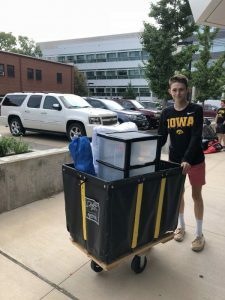 Posted on August 21, 2018 Leave a comment on First Week living in Iowa City!